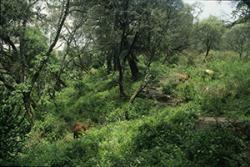 Cattle grazing in an Ethiopian forest.Forests that are sacred to local people are less likely to suffer deforestation according to results of research by Bangor University. 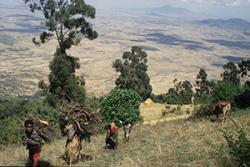 The remote Gamo Highlands in the far south-west of Ethiopia are a globally important centre of biodiversity. It is therefore concerning that research recently published in the journal Global Ecology and Conservation by Dr Desalegn Desissa Daye and Professor John Healey of the School of Environment, Natural Resources and Geography has shown that the remaining area of natural forests and grasslands in the Gamo Highlands has been reduced by more than a third since 1995 due to their conversion to farmland. However, all is not lost as the Bangor research has shown that the remaining natural forests which hold a sacred status for local people have suffered much less deforestation than those forests which lack this cultural value. While the sacred forests do receive greater protection from local communities they are still under considerable threat. They remain as just small isolated patches and the traditional cultural values linked to these forests are being eroded within local society. Therefore, conservation of biodiversity in this part of Ethiopia will depend on a combination of support for traditional cultural values, practical conservation measures to protect and restore the sacred forests, and improvement in the sustainability of agricultural land use across the highlands landscape. Wood collecting at the margins of an Ethiopian forest.“As sacred forests are found in many cultures around the world, there is some hope that, in addition to their cultural significance, the persistence of these values can make an important contribution to conservation of biodiversity,” commented John Healey, Professor of Forest Sciences at Bangor University.